Robert Kiyosaki, author of Rich Dad Poor Dad - the international runaway bestseller that has held a top spot on the New York Times bestsellers list for over six years - is an investor, entrepreneur and educator whose perspectives on money and investing fly in the face of conventional wisdom. He has, virtually single-handedly, challenged and changed the way tens of millions, around the world, think about money. OVER 6 YEARS ON THE NEW YORK TIMES BEST SELLER LIST! In communicating his point of view on why 'old' advice - get a good job, save money, get out of debt, invest for the long term, and diversify - is 'bad' (both obsolete and flawed) advice, Robert has earned a reputation for straight talk, irreverence and courage. 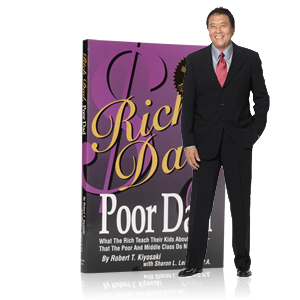 Rich Dad Poor Dad ranks as the longest-running bestseller on all four of the lists that report to Publisher's Weekly - The New York Times, Business Week, The Wall Street Journal and USA Today - and was named "USA Today's #1 Money Book" two years in a row. It is the third longest-running 'how-to' best seller of all time. Translated into 51 languages and available in 109 countries, the Rich Dad series has sold over 27 million copies worldwide and has dominated best sellers lists across Asia, Australia, South America, Mexico and Europe. In 2005, Robert was inducted into Amazon.com Hall of Fame as one of that bookseller's Top 25 Authors. There are currently 26 books in the Rich Dad series. Robert writes a bi-weekly column - 'Why the Rich Are Getting Richer' - for Yahoo! Finance and a monthly column titled 'Rich Returns' for Entrepreneur magazine. Prior to writing Rich Dad Poor Dad, Robert created the educational board game CASHFLOW 101 to teach individuals the financial and investment strategies that his rich dad spent years teaching him. It was those same strategies that allowed Robert to retire at age 47. Today there are more that 2,100 CASHFLOW Clubs - game groups independent of the Rich Dad Company - in cities throughout the world. Born and raised in Hawaii, Robert Kiyosaki is a fourth-generation Japanese-American. After graduating from college in New York, Robert joined the Marine Corps and served in Vietnam as an officer and helicopter gunship pilot. Following the war, Robert went to work in sales for Xerox Corporation and, in 1977, started a company that brought the first nylon and Velcro 'surfer wallets' to market. He founded an international education company in 1985 that taught business and investing to tens of thousands of students throughout the world. In 1994 Robert sold his business and, through his investments, was able to retire at the age of 47. During his short-lived retirement he wrote Rich Dad Poor Dad. Aug. 23: Chris Waltzek & Congressman Ron Paul!